It’s no secret in Winston-Salem that our city is affected by poverty, but most residents don’t understand how severe the problem actually is. A 2015 Harvard study found that Forsyth County is the worst standard county in the United States in which to be born impoverished. Just over 20% of Forsyth County residents live in poverty. This poverty rate is significantly higher than most other urban areas of comparable size, and represents over 70,000 people living at or below the poverty line in Forsyth.2 What does it mean for someone in our community to live in poverty? 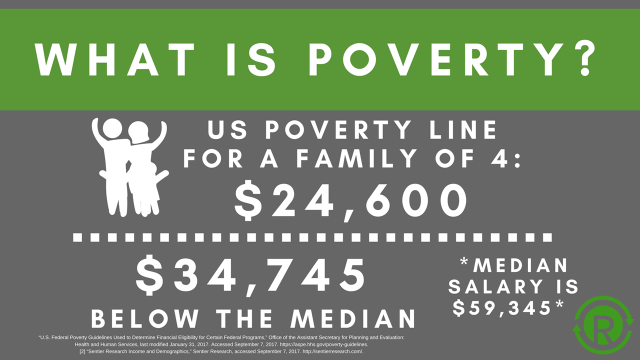 The official poverty line in the United States in 2017 is $12,060 per year for an individual, and $24,600 per year for a family of four.3 It is difficult for most people to imagine trying to make ends meet on this budget, much less sustain any quality of life. Thousands of our neighbors live in these conditions every day. While Wilson is discussing African Americans in this excerpt, the same principles could largely be applied to the Hispanic community as well. Though this skills disparity is national in scope, it manifests itself with unique severity in Winston-Salem due to the overwhelming collapse of the city’s low skill labor market just a few years ago (See “The Past” on this website). This high concentration of a disenfranchised, low-skill workforce in Winston-Salem has been a major contributing factor in the city’s struggle with poverty. 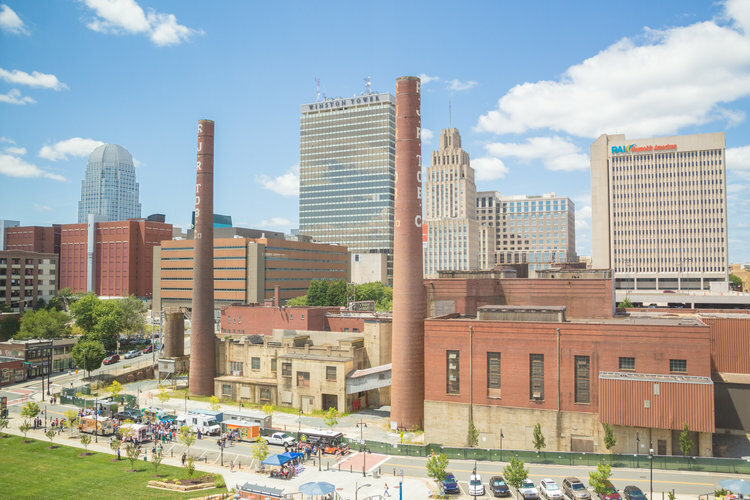 In the intervening years since its economic meltdown, Winston-Salem’s economy has mounted a tremendous rebound in a pivot towards technology and modern innovation. Much of the area filled with Reynolds’ old factories is now known as the Wake Forest Innovation Quarter, the fastest growing urban research park in the United States. The Innovation Quarter is home to over 120 companies, leading the way in areas such as biotech, information technology, digital media, medical research, and higher education.6 While this is a brilliant achievement for Winston-Salem (which has adopted the slogan “City of Arts and Innovation”), it has not proved beneficial to all of the city’s residents. Somewhat counter intuitively, poverty in Winston-Salem has steadily trended upward over the last decade while these new industries have flourished.7 What’s going on? The low skill, economically disadvantaged people of Winston-Salem are not the ones filling these new jobs. Winston-Salem has grown in recent years, with many people relocating to take advantage of the exciting job opportunities here in town. Many of these new jobs are being filled by highly skilled, well educated professionals who as a rule are not coming out of Winston’s economically depressed neighborhoods. The disenfranchised, low-skill work force is still here, and statistically has little chance of participating in the economy of innovation. This is what William Julius Wilson, quoted above, refers to as a job-spatial mismatch.8 Thousands of low skill workers are crowded in and around downtown Winston-Salem, where they don’t realistically have a chance at working anything more than a low paying service job. Many of the people who live closest to Winston-Salem’s vibrant centers of innovation are in reality farthest away. These communities have been in poverty for decades, they are still in poverty, and they will remain in poverty if we do join together in a full stop, relentless effort to end this cycle of injustice. 1 Raj Chetty and Nathaniel Hendren. “Data from Chetty and Hendren (2015): Causal Effects, Mobility Estimates and Covariates by County, CZ and Birth Cohort.” Equality of Opportunity, Harvard University. 2015, http://www.equality-of-opportunity.org/index.php/data. 2 Elizabeth Lees, “Forsyth County Demographics, 2014,” Forsyth Futures, last modified December 2015, accessed September 8, 2017. https://www.forsythfutures.org/stories/s/xgbf-fwxh/. 3 “U.S. Federal Poverty Guidelines Used to Determine Financial Eligibility for Certain Federal Programs,” Office of the Assistant Secretary for Planning and Evaluation: Health and Human Services, last modified January 31, 2017. Accessed September 7, 2017. https://aspe.hhs.gov/poverty-guidelines. 5 William Julius Wilson. More than Just Race: Being Black and Poor in the Inner-City. (New York: W.W. Norton & Company, 2009) 9-10.